Vince Staples returns with his troubled and furious second album, The Big Fish Theory. Vince Staples is a preternaturally gifted rapper that's been making major waves since his chilling breakout verse on Earl Sweatshirt's "Hive" in 2013. Playing foil to Earl's poetic introspection, Staples hit the song with cold, detached observation and threats that felt sociopathic as opposed to stunting. The schism between Staples and Earl evidenced on that song isn't too different from Staples and the rap world at large. Where much of rap now is heavily influenced by trap, as well as absurd juxtaposition and alliterative runs pioneered by Ghostface Killah and Cam'ron, Staples occupies a unique space that diminishes affectation for clarity in delivery. That clarity is also evidenced in the clean conceptual territory that his last two releases have followed -- his debut album Summertime '06 is a bildungsroman about losing his sense of youth and last year's Prima Donna EP, which was inspired by Amy Winehouse, the meditates on a rapper that becomes successful and commits suicide. While his music may at first seem workmanlike, Staples's attention to detail and big-tent thinking reveal it to be not only ambitious but experimental, unafraid of pushing lyrical and sonic buttons that actively challenge the listener. Staples's latest, The Big Fish Theory, feels like something a blend of his previous two releases: it's the rumination of a young, successful rapper amid the maelstrom of fame. The album is relatively short, running only 36 minutes across 12 tracks. The brevity is evidenced in Staples's verses, which themselves number about only two per song. At times, Staples runs through familiar lyrical territory -- emotional disconnection with a lover or boasts about his lyric prowess and achievements -- but he's able to enrich them through his urgent delivery that imbues each song with austerity and intensity. There is little light to this album -- the hedonistic impulses imply emptiness while the self-aggrandizing statements are put alongside pained observations of the greater racial conflicts in American culture. This juxtaposition is eyed throughout the record with lyrics like, "How am I supposed to have a good time when death and destruction is all that I see?" or others that make reference to "fighting the white man every day", black men being crucified or being handcuffed with their skin turning blue. One can feel the exhaustion within Staples's point of view: his lyrics are not a mere observation of his life, but a fight for agency in a country that will judge him by the color of his skin versus any talent or achievement he might reach. Staples clearly understands himself to be special, going so far as to refer to himself as a genius on "Homage", but understands the fragility of this position, referencing the actor River Phoenix, another precocious talent who died too early. His clear interest in "taken too soon" talents like Winehouse and Phoenix take on a new poignancy when put alongside the grander observations of racial violence. 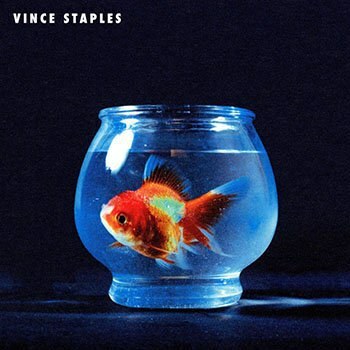 The Big Fish Theory underscores the politics of Staples's lyrics through its sound. Actively engaging with both Detroit techno and house music, the album restores the politics that were naturally embedded in the music by the artists that initially made it. Before being coopted into the mainstream, techno and house music both reflected the industrialized urban centers that the artists making the music lived in while also providing an inclusionary bastion for people of different cultural backgrounds, races, and sexualities. The Big Fish Theory feels like a modern iteration of these genres in practice, versus the Xeroxed impression you might have listening to a Disclosure record. The bass throughout is both melodic and punishing, often featured very high in the mix, so it runs in conflict to Staples's vocals rather than serving them. The Big Fish Theory is a powerful and troubling record. It's an epic in miniature that shows a natural progression from Staples's previous work. Fitfully angered and alive, it offers no solution other than to simply commune with its sound. It's decidedly imperfect, mirroring the discomfort at the center of its maker's mind.